The Home Innovation NGBS Green Certified Guidelines were written to serve as a voluntary “baseline” so that NGBS members could easily develop local green building programs. Home Innovation NGBS Green Certified green homes incorporate environmental considerations and resource efficiency into every step of the building and development process to minimize environmental impact. 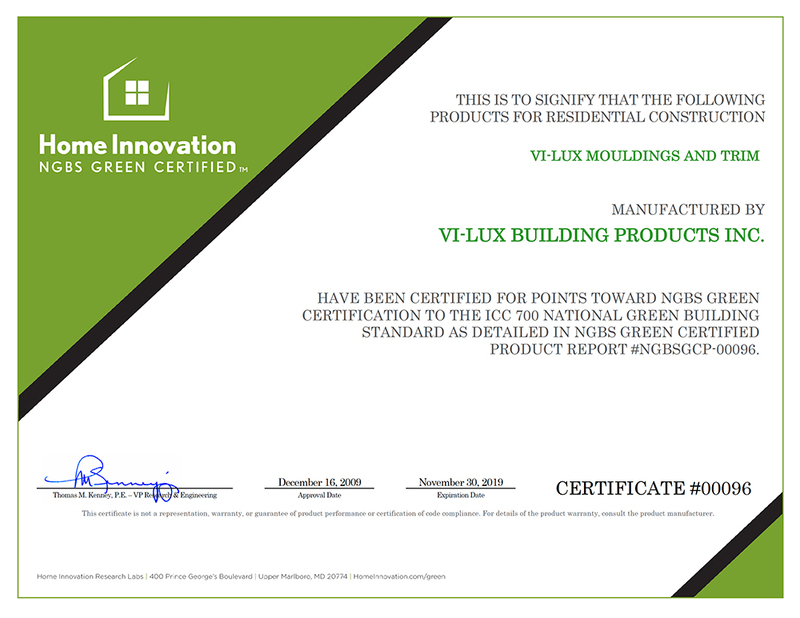 WHAT STANDARD WITHIN EACH CATEGORY CAN VI‑LUX BUILDING PRODUCTS INC. CONTRIBUTE TO EARNING NGBS POINTS? Practice 2012 NGBS 601.7 – Building materials/assemblies do not require additional site applied material for finishing. 12 points max. awarded. Potential Points Available: 2-5. For 5 points, 90% or more of the installed trim must be this product. For 2 points, 50-90% of the installed trim must be this product. Practice 2012 NGBS 602.1.6 – Termite-resistant materials are used in portions of the building. Potential Points Available: 2-6. To earn 2 points, product is used in conjunction with other termite resistant materials for the first 2 feet of all the foundation, floor, and structural wall, wall clading, and exterior deck components in zones with slight to moderate termite infestation. 4 points are awarded when used in conjunction with other termite resistant materials for the first 3 feet in moderate to heavy termite zones, and 6 points are awarded for use with other termite resistant materials for all of the foundation, floor, and structural wall, wall clading, and exterior deck components in areas of very heavy termites. Practice 2012 NGBS 611.1 – Product manufacturer’s operations are ISO 14001 certified. The value of building products from ISO 14001 facilities is 1% or more of the est. total building materials cost. Potential Points Available: 1. Points are awarded at 1 point per one percent of building material costs. Material cost breakdown to be verified and points adjusted to reflect actual percentage of all products from 14001 facilities (10 points max). Practice 2015 NGBS 601.7 – Prefinished building materials/assemblies have no additional site applied finishing. 12 points max. awarded. Potential Points Available: 1,2,5. For 5 points, 90% or more of the installed trim must be this product. For 2 points, 50-90% of the installed trim must be this product. One point for 35-50% of the installed trim. Practice 2015 NGBS 602.1.6 – Termite-resistant materials are used in portions of the building… Potential Points Available: 2-6. To earn 2 points, product is used in conjunction with other termite resistant materials for the first 2 feet of all the foundation, floor, and structural wall, wall clading, and exterior deck components in zones with slight to moderate termite infestation. 4 points are awarded when used in conjunction with other termite resistant materials for the first 3 feet in moderate to heavy termite zones, and 6 points are awarded for use with other termite resistant materials for all of the foundation, floor, and structural wall, wall clading, and exterior deck components in areas of very heavy termites. Practice 2015 NGBS 611.1 – Product manufacturer’s operations are ISO 14001 certified. The value of building products from ISO 14001 facilities is 1% or more of the est. total building materials cost. Potential Points Available: 1. Points are awarded at 1 point per one percent of building material costs. Material cost breakdown to be verified and points adjusted to reflect actual percentage of all products from 14001 facilities (10 points max).